An assay on the flow analysis of pg mL -1 level kaempferol with chemiluminescence detection was presented in this paper. It was found that the chemiluminescence intensity from the oxidation reaction between luminol and dissolved oxygen could be enhanced in the presence of kaempferol. 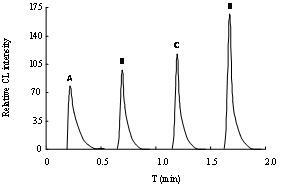 The increment of chemiluminescence intensity was proportional to the concentration of kaempferol, and the linear range was from 0.01 to 3.00 ng mL-1 ( R2 = 0.9992 ) with the detection limit (3?) of 3.5 pg mL-1. The analytical process, including sampling and washing, could be performed within 0.5 min with a relative standard deviation (RSD) of less than 4% (n = 5) . The proposed method was applied to detect ing kaempferol directly in purified and unpurified fermentation broth without any pre-treatment process, which was produced by Sinopodophyllum emodi (Wall.) Ying endophytic fungus .